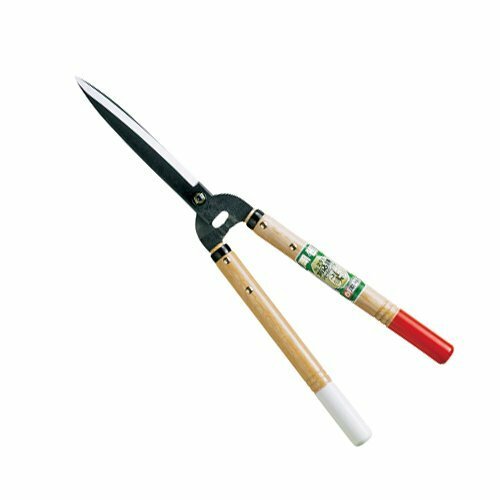 Okatsune 231 is the pure essence of the hedge shears: - Razor sharp, always with a clean cut simple design for optimum usability - an ultra light weight and heavy duty the Okatsune hedge shears is very easy to use and are in use much pleasure. You're sure to find that you can customise very precise and the shape of your hedge with ease. The Japanese white oak handles are known to absorb vibrations. For this reason, the work with these scissors a very enjoyable experience. The combination of the 200 mm blade as well as the 300 mm long handles ensures a perfect balance and sufficient strength, which you need to with ease The Hedge to be cut or the branches to trim. The blades of this Japanese hedge scissors (Karikomi basami) on unique way Made from the finest Izumo Yasugi steel forged and have a high level of Rockwell hardness rating of 60 to 61. This hardness is guaranteed that blades stay sharp for longer and will always producing a clean and precise cut in wood vollfhren. Nevertheless, soft metal in the blade core ensures the necessary durability to scissors. The strength ensures that the blade adjusts to good to the very robust and even carrying heavy loads not break. In contrast to the 207 and switches are 217 The its impact to the left side of the blade shoulder is mounted, the Okatsune 231 Features a built-in stop function. The blades are very simply plugs into the Okatsune Whetstone (Okatsune 412). A leather sheath for blade is included (like the picture in the description).